Buy wholesale pipe screen for your smoke shop or c-store. This section displays all discounted rates on available pipe screen. 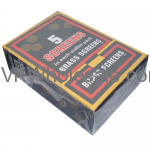 Minimum quantity for "Brass/Sliver Screens - 100 pk" is 1.